Welcome to our new website address, anfangchiro.com, and our new email addresses: DrAnfang@anfangchiro.com and Kathy@anfangchiro.com. 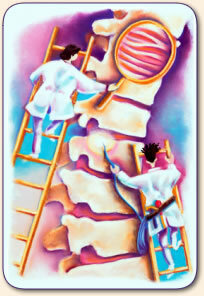 Dr. Dyanna Anfang is a chiropractor with twenty-five years of experience as a health care provider. She utilizes gentle, low-force adjusting techniques to improve spinal alignment, which optimizes nervous system function. Moving stiff spinal segments nourishes the bones, discs, and ligaments, and soothes pain impulses. In addition to spinal adjustment and muscle therapy, Dr. Anfang will help you improve your posture and ergonomics, and will formulate a stretching and strengthening program for your unique health care goals. We are conveniently located in central Berkeley, just two blocks from the U. C. campus. We are preferred providers for many health insurance plans. It is our great pleasure to help you to improve your health. Services | About Dr. Anfang | What is Chiropractic?